My lower fixed retainer came out, what should I do? If your lower fixed retainer fell out or is loose, call your orthodontist as soon as possible. 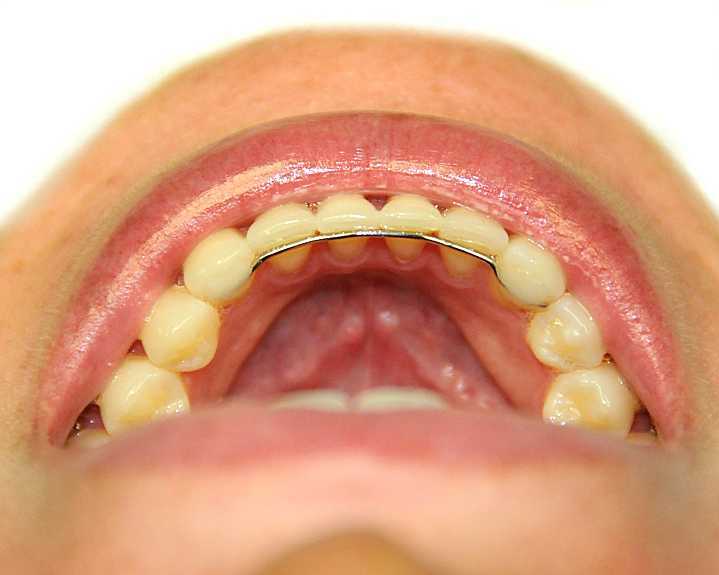 As soon as this type of retainer comes out or is loose, natural forces can move the teeth immediately. You can talk to your orthodontist about other options of retaining your tooth positions besides a fixed retainer. Or, your orthodontist can repair or replace your fixed retainer. What is a fixed orthodontic retainer? After braces are removed, an orthodontist has some options for retaining the new positions of your teeth. Those options would include a removable Hawley retainer, a clear thermoplastic retainer and a fixed lower lingual retainer. A fix lower retainer is a wire bonded to the back side of the lower six teeth from cuspid to cuspid. Since the majority of the movement after braces is in this area, some orthodontists will use this type of retainer. How long should I keep a fixed lower retainer? That depends on your orthodontist. Some patients have had their fixed retainer in for years. The main problem you can have with a fixed lower retainer is calculus can build up around the wire easily. It’s hard to keep clean. Ask your orthodontist when your fixed retainer should be removed. At some point in time, natural forces need to be allowed to come into play. When a fixed retainer is removed, the orthodontist needs to follow you to see if any tooth movement occurs and take proper action. I’ve had my permanent retainer on my bottom six teeth for 12, almost 13 years now. The other day, I bit into a sandwich at my local sandwich shop, and my permanent retainer fell completely out. The bread wasn’t even hard! I’ve contacted my dentist to see about possibly just getting the cement left in removed. Should I just get it put back in? How long do permanent retainers typically last? I’ve also heard that they can also eventually lead to rotten teeth, even if you do everything you’re supposed to do (including flossing with threaders). Is that true? Thanks! 1. There is no special time limit that a permanent retainer should be used. When it is finally removed, natural forces will come into play and your teeth may move. I recommend having a clear plastic retainer made, so that you can wear it and slowly wean yourself off of it. A permanent retainer is like having braces on the back side of your lower teeth. Eventually, you have to let them go to see if the teeth will try to move. If they try to move, an orthodontist will make adjustments to the width of your teeth to relieve pressure. This is called interproximal reduction. You need to watch your lower incisors for movement. If you see movement, see an orthodontist soon. 2. The cement needs to be removed. Your family dentist can accomplish this task. 3. You do have the option of getting another fixed permanent retainer, but I still recommend #1. 4. Your teeth will not decay, if you keep your permanent retainer clean by having regular cleanings, flossing and brushing. Flossing is very important. Just by having a permanent retainer on your teeth does increase the chances for a cavity. I don’t use fixed retainers often. I’m not a fan, just because of your scenario. You aren’t really completely finished with your orthodontic treatment. You probably are not seeing your orthodontist and you need to talk with them again about this situation. Lower fixed retainers are nice because there is no compliance issues however at some point in time, they need to be removed. ← Previous Previous post: Can I Play Sports with Braces on My Teeth? Next → Next post: Why can’t I chew gum while wearing Braces?